Last weekend, I slept in the midst of desert dunes! Oh yes I'm serious, but it is not what you think it is. Forget about the tent, the bonfire, and the sleeping bag. Think about a stunning hotel tucked on the edge of the Rub Al Khali desert with opulent Arabian chandeliers and a plush bed covered in crisp white linens. I was at Tilal Liwa Hotel. Tilal Liwa Hotel is a 4-star property, managed by Danat Hotels and Resorts, located 2 hours away from the heart of Abu Dhabi. We don't drive, so we arranged hotel pick up and drop off a few days before our stay. And just as planned, a 4x4 came to fetch us in Abu Dhabi bus terminal. Based on the photos I have seen in the net, I thought we would traverse rugged desert terrain a la desert safari enroute to the hotel. Silly me! It turned out that there is a proper road connecting the highly-urbanized city to the desert hideaway, passing through the sleepy little town of Al Gharbia. It was high noon when we arrived in Tilal Liwa Hotel. A staff immediately took care of our bags, hence we went inside the hotel literally freed from heavy load! I was pleasantly surprised to see the hotel lobby. Albeit small, it was wrapped in lavish details showcasing the true spirit of Arabia. As it was a busy hour at the check-in counter, we didn't mind waiting for a couple of minutes. I used that time to have a quick look at the terrace overlooking the most photographed hotel amenity - the infinity pool! It didn't take long before we were called for check-in. From there, it was a breeze! During peak season, when the lobby gets too busy, Tilal Liwa Hotel opens their Majlis. It is a traditional Arabic room where guests can sit back and relax. Majlis is an Arabic word which means "a place of sitting". Ed and I got the chance to see it as the staff were kind enough to give us a tour around the property during our stay. Tilal Liwa Hotel has 7 room categories. We stayed in Tilal Room - a superior room with twin bed that the housekeeping staff magically turned into a huge bed bigger than king size upon our request. Our room has all the basics (tea/coffee making facility, coffee table, work desk, mini-bar, in-room safe, TV) and complimentary high speed internet access! The bathroom is spacious; equipped with bathtub, rain shower and organic toiletries. It is not as grand as the bath in the Majaheem Suite which was shown to us during the tour, but I was greatly satisfied with it. Tilal Room is simply just right for our humble needs. I'm a fan of Danat Hotels' organic toiletries! We were on a full-board stay, hence all our meals were taken at Al Badiya Restaurant - Tilal Liwa Hotel's all day dining restaurant, except for one morning when breakfast was specially delivered to our room. Al Badiya restaurant looks too elegant for an all day dining! I immensely adore the bespoke Arabic chandeliers hanging above the dining area. The buffet spread for breakfast, lunch, and dinner were of good variety, although not as vast as the hotel buffets in Dubai. During the weekend, hotel guests flock at the restaurant, hence I truly understood why the waiting staff all looked rushed. But I still think a little smile wouldn't hurt. Drinks and snacks are served in Al Liwan - a bar near the infinity pool. It was buzzing on a weekend afternoon. There's live music which turned a portion of the garden (and even the pool) into a dance floor! We enjoyed swaying to the beat of Shakira's Waka Waka, Lionel's All Night Long and the like! Ahhh, it was fun! Staying true to the Arabian concept, Tilal Liwa also has Al Dhafrah Oasis where guests can have an authentic Middle Eastern dining experience. Bedouin tents were built in the lush oasis, a perfect venue for barbecue dinners and Arabian-inspired gala celebrations. Tilal Liwa is a small, homey hotel. Guests usually gather at the manicured lawn and the pool side, if not in the desert, when the sun is no longer scorching. There's a well-equipped recreation club indoor, but the great outdoors is so inviting that we spent most of the time soaking up the sun. The highlight of the hotel is, undoubtedly, the infinity pool! It beautifully frames the majestic dunes of Liwa desert. The pool is temperature controlled, hence it is perfect for a relaxing dip under the summer sunshine. Photos below were taken early morning and midday. There's a whole new scenario in the afternoon. All sun loungers occupied. Infinity pool not empty. Ambiance super SUPER lively! Serenity on a Thursday, after lunch. What makes Tilal Liwa Hotel different from all the hotels we have been to is the breathtaking location. A few steps away from back entrance is an unspoilt desert landscape where guests can enjoy desert activities like camel trekking, quad biking, kite flying, star gazing! Desert Safari to Rub Al Khali or the Empty Quarter, the largest sand desert in the world, can be arranged at the hotel concierge. The vast sea of sand dunes blew my senses away! It has that certain tranquility that relaxed the soul, mystic golden hue than made me more thankful for the opportunity to live in the UAE, and endless splendor that made me ponder on Gustave Flaubert's quote: "Travel makes one modest. You see what a tiny space you occupy in the world." I never thought kite flying can be sooo fun in the desert! Ummm, just me in my travel stoked state. Our signature #HighFiveJump travel pose in Tilal Liwa Hotel. Excuse Ed's bedroom slippers. Loong story, but to make it short, one of his flip flops fell while we were quad biking in the desert and left unfound. Transportation to the hotel is available for a fee. 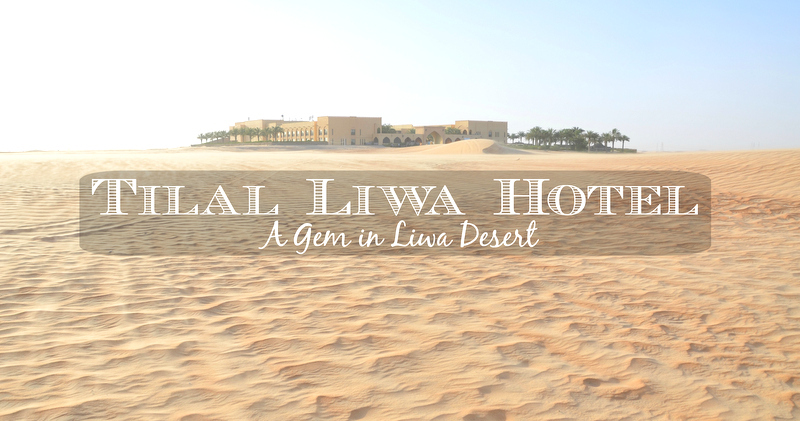 We were invited to stay at Tilal Liwa Hotel. Opinions in this blog post are my own.